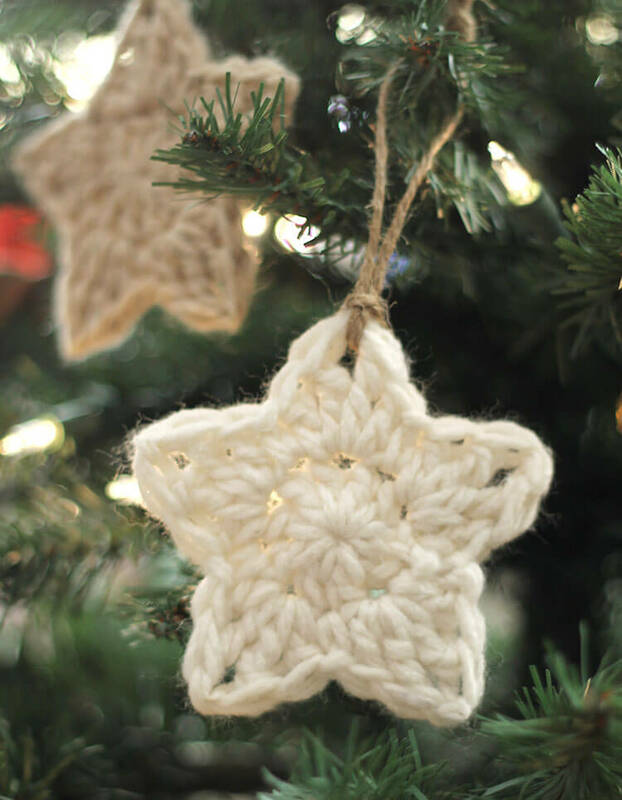 These simple Christmas crochet stars are a free pattern that makes a fun and easy holiday project! 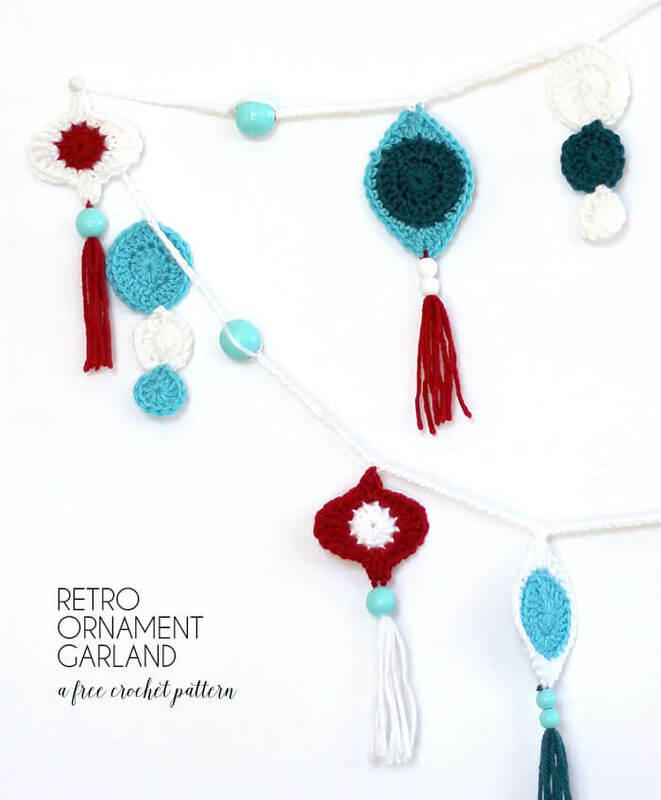 Use them as ornaments on your tree or as decorations and appliques any time of year. This post was originally shared at Darice, and may contain affiliate links. See my full disclosure policy here. 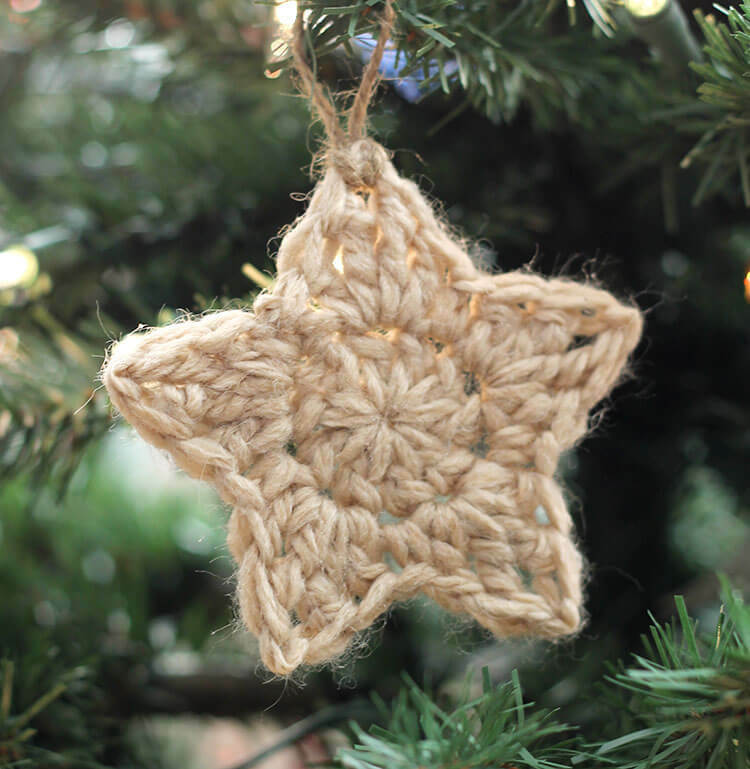 I love to crochet, and I extra love quick and simple crochet projects, which is why these little crochet stars are the best. This pattern is incredibly easy to make – just two short rounds and your star is done! 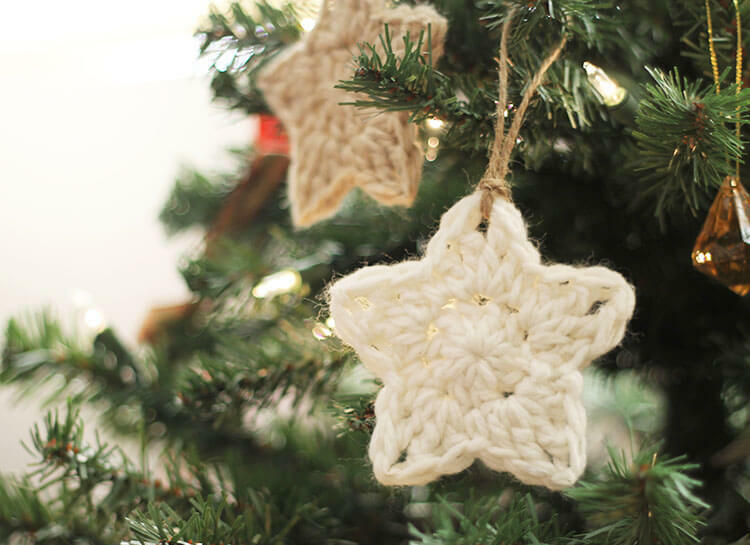 You can make some to hang on your Christmas tree, attach them to special gifts, or work up a whole constellation and string them onto a starry garland. Okay – let’s make us some stars! 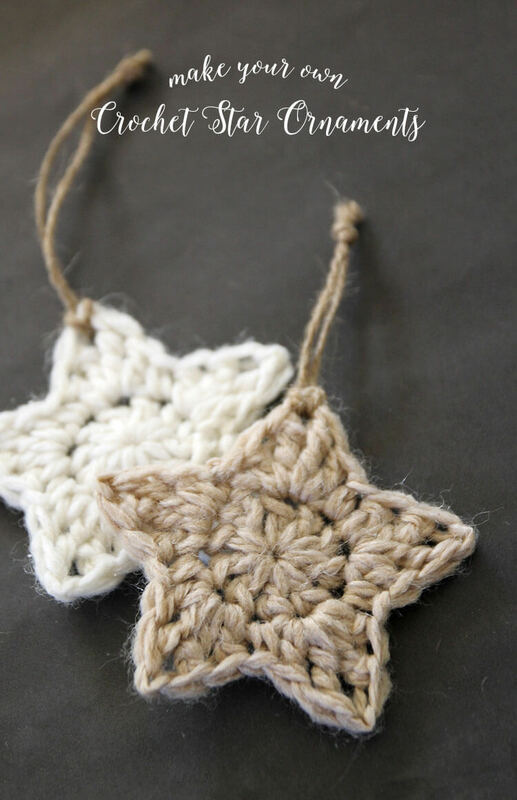 When you are done with the crochet stars pattern, your star’s points will be rounded and it might look more like a flower than a star. But don’t worry! That star will shape up when we block it. Let’s do that right now, shall we? 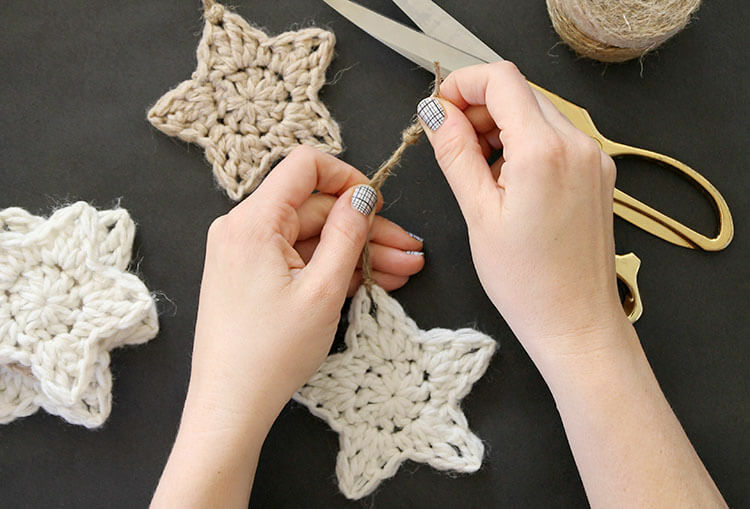 To stiffen and shape your stars, mix a little of the fabric stiffener solution with some water to thin it out, then dip the crochet stars into the solution making sure it gets fully covered. Squeeze out the excess. If you have a blocking mat you can use that, but if not, go dig through your recycling bin and pull out a piece of cardboard. 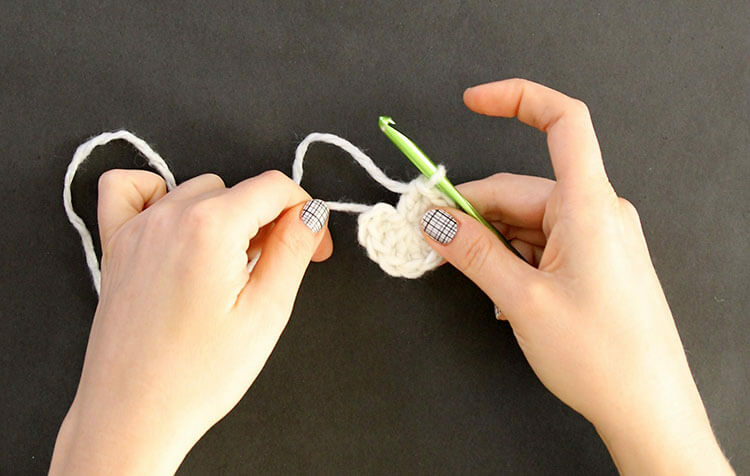 Wrap it with some plastic wrap, secure that with a piece of tape on the back, and – TaDA! 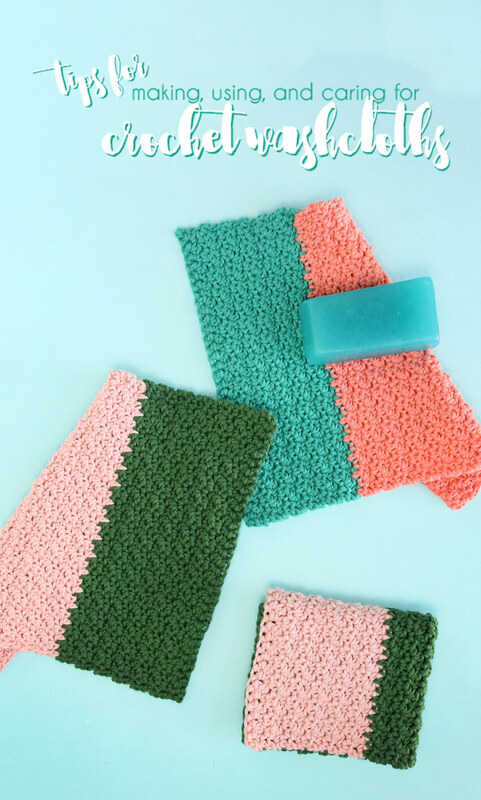 – blocking mat! Place the star on your mat and stretch it into shape. 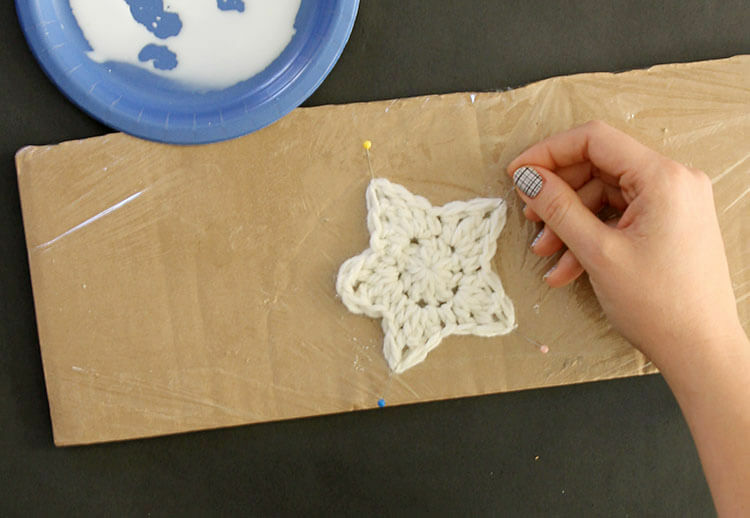 Use straight pins to pull out the star’s points and hold them in place. Once your stars are pinned in place, set them aside to dry. It will take several hours for them to dry completely. When they are all dry, the stars should be stiff and hold their shape. All that’s left to do is attach jute ties to your ornaments. Just loop a length of jute through one of the points and tie the loop closed. And that’s it! 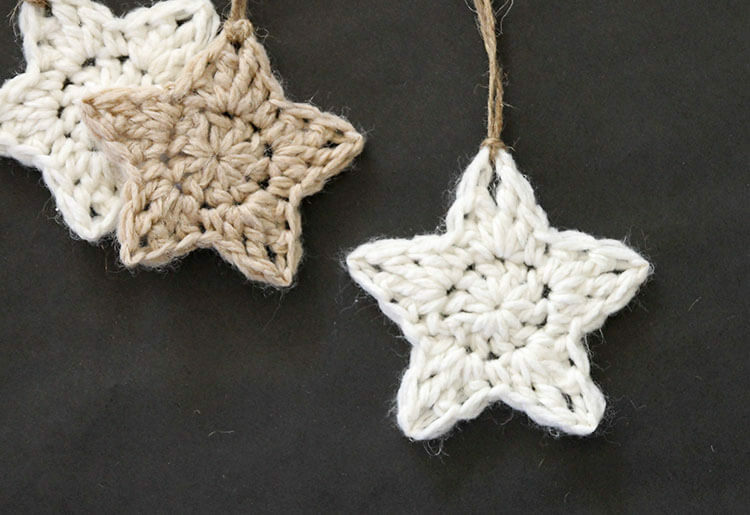 These cute crochet stars are all ready to hang on your tree or dress up your gifts this year. If you make your own stars I’d love for you to tag me on instagram or share you project to my facebook page! 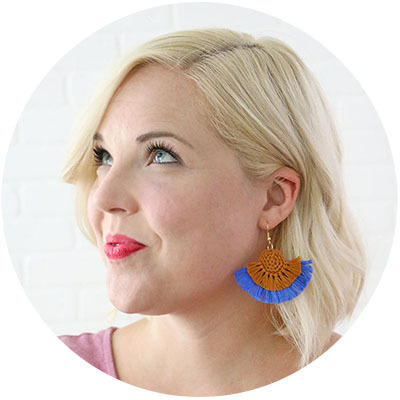 Psst… My friend Alli has a great tutorial on How to Make a Burlap Bow that would go perfectly with these stars! 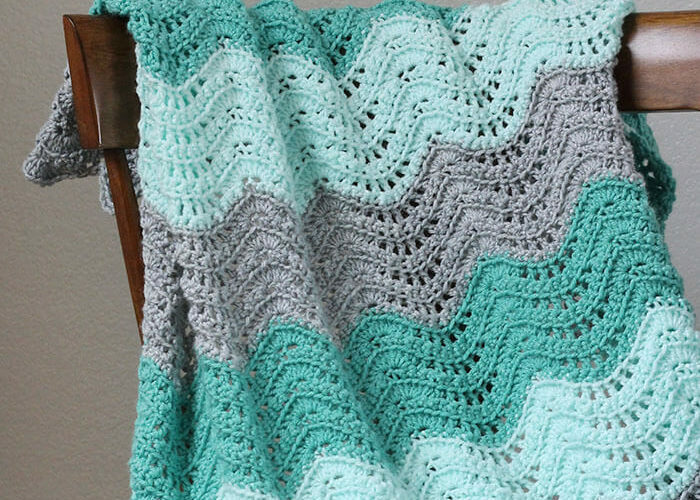 Don’t miss my other free patterns! 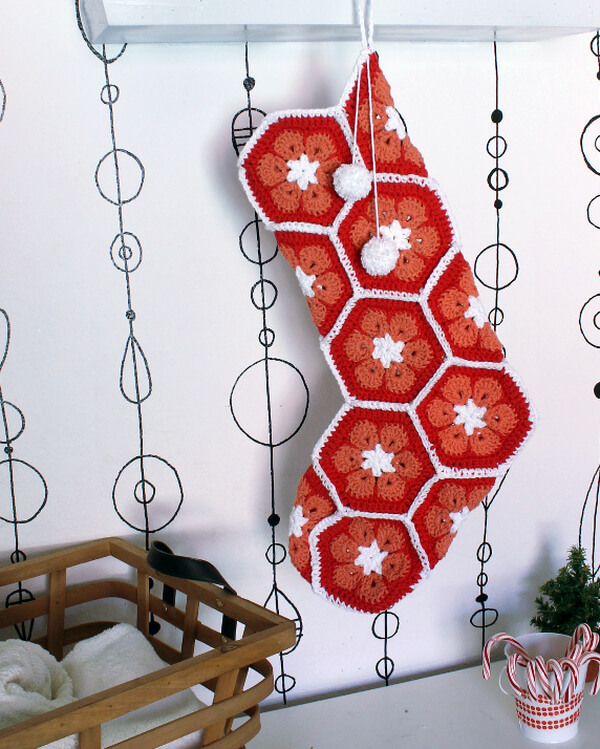 I’m loving your crocheted ornaments this season. These are too cute! These ornaments are super cozy! Your kids are so lucky to have such a creative mom and I bet it’s really fun to grow up in your home! These are simple beauties, for sure! I’m going to make some tonight and will let you know how they turn out. Thank you for sharing! Yay! I would love to see them! One question: Do you know how long they will stay blocked or “stiff”? I wouldn’t want to gift these to people only to find out that when they take them out to decorate next year, they’ve all turned back into pretty “flowers”. 😉 I’ve never used stiffening agent before, nor have I ever blocked anything! Hi Tracy! If you use a good amount of stiffener and they are really stiff when you are done, they should stay stiff for years. Humidity and storage may affect things, but I’ve never had trouble with it. Good luck! These are gorgeous! I wish I could find time next year to learn crochet! This looks great! I’ll try it…thanks for sharing! what is the magic loop and how do you make one? Hi Deb! The magic loop is just one way of starting when working in the round. 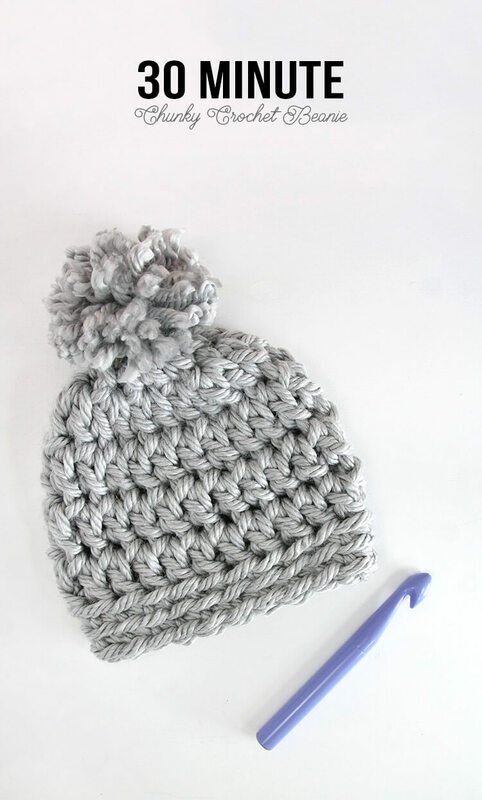 It allows you to get a smaller hole in the finished hat. 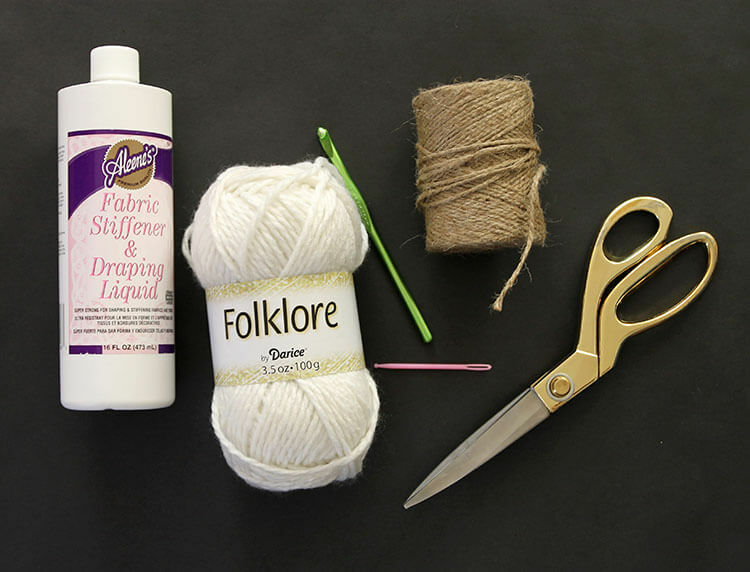 You can see a video on how to do the magic loop here: https://www.youtube.com/watch?v=gEq48ABHRZo OR if you don’t feel comfortable trying a new technique, you could just chain 4, join to make a loop, and then work your first stitches into that loop. Good luck! thanks so much for sending the video link. It looks easy peasy to make a magic circle. How cute they are! Simple and beautiful! The stars are beautiful! I’m looking forward to giving them a try. Thanks Alexis for sharing your pattern! Hi Diana! If you use worsted weight yarn, you will want to use a smaller hook to fit that yarn and your finished stars will be smaller. Good luck! Would Modge Podge diluted with water also work as a stiffening agent? I haven’t tried that, but it sounds like it would work! I know you can use watered down Elmer’s glue or a boiled sugar water solution. Good luck! Thank you for sharing,I love these??? Thank you so much for this pattern! I found it through Pinterest and may or may not be addicted to making them! Oh good! I love that you like it! 🙂 Enjoy your star making! Thank you for sharing these cute stars. Can’t wait to get started!!! Merry Christmas!!!! Hello! An American single crochet (sc) is the same as a UK double crochet (dc), and our dc is your treble. I hope that helps! Haha! Well, sorry about the silly putty. 🙂 I haven’t tried liquid starch myself, but I think that should work great. Good luck! Alexis, I have been crocheting different star patterns all day. Your ornament start pattern is so cute and so simple. It has won a place on my Americana Throw I have just finished making! Thank you. 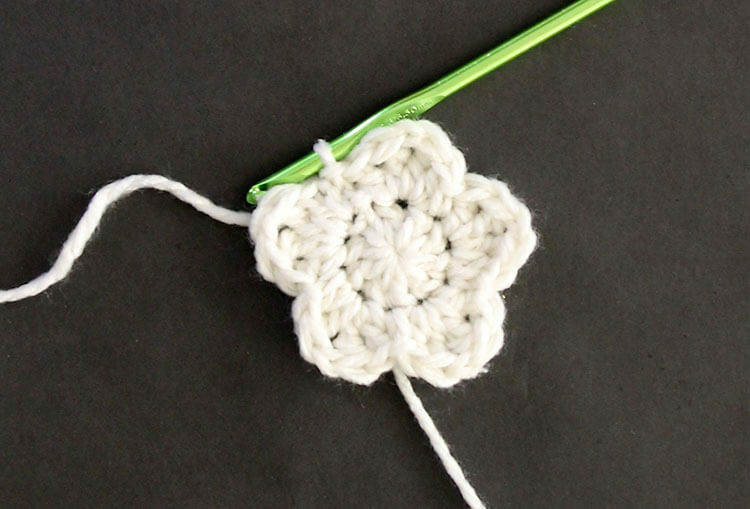 Im new to crochet and trying this star. Just wondered if you have time, whether you could clarify the second round, where it says ‘single crochet in the same space?’ Im not sure which stitch that refers to. I think a US treble crochet is the same as a UK double treble. 🙂 Good luck! I wish you had a Pinterest button. Hi Carol! If you hover over any photo, a pin it button should pop up in the left corner. Hope that helps! Is there anywhere that you have the pattern of the star that can be printed off?